Like most of the world I was greatly saddened by the news on Thursday night of the passing of Nelson Mandela. Great men and women are in part made great events and the struggle against Apartheid was undoubtedly in that category. To liberal opinion there was no essence of doubt about the justice of the cause of the majority black population in South Africa. Furthermore, while with hindsight the Apartheid regime might have been intrinsically unsustainable, that was not the impression at the time. Victory was not guaranteed and that it should come without a bloodbath was certainly not assured. It is Mandela’s unique achievement to have enabled the end of such a great injustice with the minimum of recrimination or retribution. Mandela’s strength, it strikes me, was a product of both personal qualities and experience. This was a man of great principle, willing as he once famously said to die for the things in which he believed. His political career was clearly defined by those issues of principle and not, as with lesser men in lesser times, by personal ambition. He was inspiring, a great public speaker but also determined, compelling and charming in private, as many of those paying tribute in the last couple of days have attested. He had, even from early days, a quality of even handedness in his dealings which would stand in great stead in the crucial years around the end of Apartheid. Mandela was also defined by what he had been through and survived. He had, on two occasions, been put on trial for offences carrying the death penalty. For 27 years he was a prisoner in Robben Island, largely isolated from the outside world, living in conditions of great hardship, unable to attend the funeral of his own son and uncertain of whether he would ever be released. His suffering and his understanding of suffering were crucial additions to his legitimacy both in securing the end of Apartheid and in ensuring that the transition to the new South Africa was a peaceful one. When Mandela left captivity on 11th February 1990 he was 71, an age most people would have been happy to pass on the challenge to a future generation. But Mandela had to rise to his greatest challenge as the opportunity eventually emerged to end Apartheid and achieve black majority rule. In doing so not only had he got to manage negotiations with the National Government of President FW de Klerk but also had to deal with the disruptive challenge of the Inkata Freedom Party and its leader Mangosuthu Buthelezi. In 1993 the assassination of Chris Hani, leader of the South African Communist Party demonstrated the genuine threat of a descent to violence. Mandela’s address to the nation calling for calm was a first hallmark of his ability to reach out to all sections of South African society. Despite all of this April 27th 1994 the day of freedom did dawn. The pictures of the queues of black voters waiting to catch their ballots remains the most powerful of images, a timely reminder to those of us in the west who have become cynical and mistrusting of democracy. Mandela was duly elected as the first black President of South Africa. Given its history South Africa could not be sure that the euphoria of April 1994 would last and Mandela had much still to do to ensure that the transition to majority rule was successful and worked too for white and minority populations. Two things stand out. 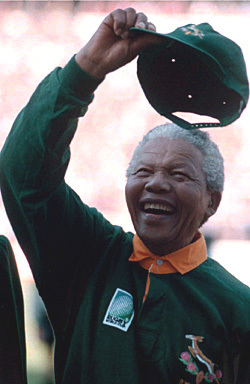 First the amazing images of Mandela appearing at the Rugby World Cup Final in a Springbok jersey. It was a political gesture of the most profound kind. On other backs it would have appeared opportunist. On Mandela’s it epitomised his ability to reach out and make peace with former enemies. I cried then when seeing it and will cry every time afterwards. The second measure was the establishment of the Truth and Reconciliation Commission, a process of holding to account the perpetrators of atrocities on both sides under Apartheid outside the normal processes of justice and escaping calls for vengeance. Though not without its critics, it is widely seen as having made a major role in cementing the peaceful transition to the new South Africa. 20 years on South Africa is far from perfect, enormous economic inequalities remains and the country is still waiting to make a proper transition to genuine political plurality. But it has a future and it still stands as a beacon for the values of the multi-racial society. Without Nelson Mandela neither would be the case. Like all the sons of earth Nelson Mandela has passed on from this world. He has been an icon of my generation and I hope profoundly he will continue to remain so for future generations. There is no better example than of a man who can be deprived of 27 years of freedom and who then, rather than seeking revenge for his hurt, instead reached out to his oppressors for the greater good not only of his own people but of that of the whole nation. There are many situations in life when that example is worth remembering.